MOSCOW (AP) Lionel Messi, arguably the greatest soccer player in history, has had a miserable World Cup and must turn it around immediately to save Argentina from a humiliating early exit from the tournament. Messi leads Argentina into a must-win Tuesday game against Nigeria at St. Petersburg Stadium, where the African team would advance out of Group D with a victory. The South Americans are winless at the World Cup, Messi has yet to score a goal, and a victory against Nigeria won’t guarantee a spot in the round of 16. Argentina must win, and get help from Croatia, which has already advanced. Croatia has no pressure in its match against Iceland, which must win its final Group D game in Rostov-on-Don to advance. If Iceland wins, Argentina is out and Messi’s international career might be over. Messi turned 31 two days before the match, and there’s strong speculation he’ll retire from the national team if Argentina loses. Argentina fans have been livid over the performances of the national team in this tournament, with much of the wrath directed at Messi. Although Nigeria coach Gernot Rohr is a fan of the five-time world player of the year, he has no sympathy for Messi’s plight Tuesday. Messi, whose 64 career goals for Argentina, missed a penalty in Argentina’s opening match, a 1-1 draw with Iceland. He also failed to score in a 3-0 loss to Croatia. It’s part of a disappointing international run in which Messi’s only medal with Argentina came 10 years ago at the Summer Olympics. He didn’t score in the 1-0 loss to Germany in the World Cup final four years ago, and was on the losing team in the Copa America finals in 2007, 2015 and 2016. Iceland, meanwhile, is the nation with the smallest population ever to qualify for a World Cup with 350,000 inhabitants. 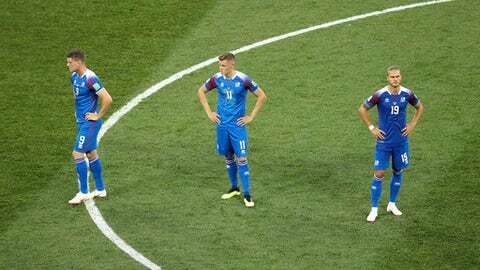 The entire nation has been following the squad, which is known at home as ”Our Boys.” The draw against Argentina was an upset, but Iceland then dropped the next game 2-0 to Nigeria. There’s tension before the game being played at Luzhniki Stadium in Moscow. Denmark coach Age Hareide criticized France before the World Cup when he told a Danish newspaper the squad was ”nothing special.” He even suggested Paul Pogba was too focused on his hairstyles. If Cahill gets into the match and scores, he’d be the fifth player to score in four World Cups – joining Pele, Uwe Seeler, Miroslav Klose and Cristiano Ronaldo.